It's unfortunately easy to forget about how much energy goes into each product we use, but 4 tea plantations in Kenya have pooled together to build a hydro plant which will power the drying of their tea leaves, which is typically done with wood. This is great news for the conservation of the area after the local government banning logging. How much are you willing to pay for a cup? How much would you be willing to spend on tea? I know I complain about a $5 tea in a cafe, but $100 for 20g? According to Perth Now, a planation in Sri Lanka is selling one of their premium teas for $1,950 per kilo! With only 120kg of the tea produced a year it's no wonder it comes with a hefty price tag. So it's also not surprising the growers go to all lengths to protect the leaves including ensuring all pickers wear gloves so not to damage the leaves. 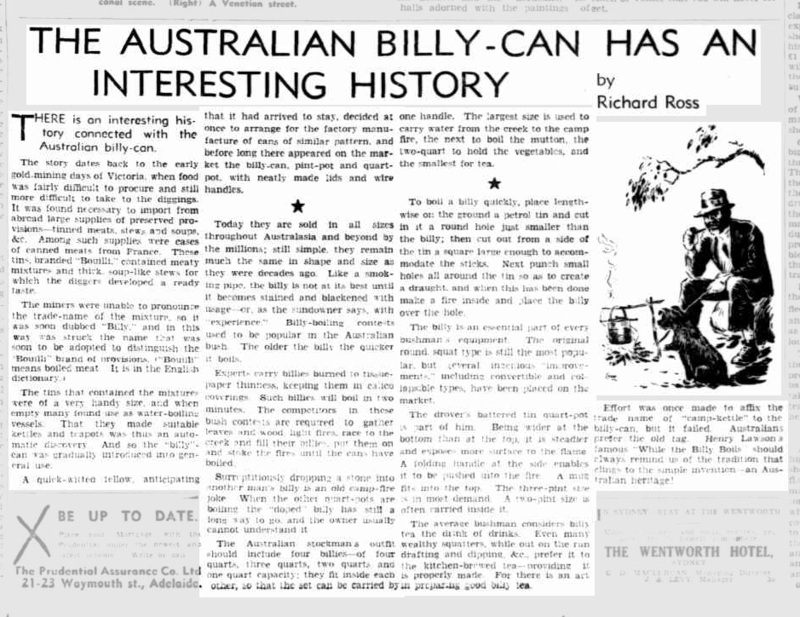 The Australian billy-can has an interesting history. Want to know more about the billy can? Well look no further, here is a article from The Advertiser (Adelaide) published 18 September 1937. THERE is an interesting history connected with the Australian billy-can. The story dates back to the early gold-mining days of Victoria, when food was fairly difficult to procure and still more difficult to take to the diggings. It was found necessary to import from abroad large supplies of preserved provisions—tinned meats, stews and soups, &c. Among such supplies were cases of canned meats from France. These tins, branded -"Bouilli," contained meaty mixtures and thick, soup-like stews for which the diggers developed a ready taste. The tins that contained the mixtures were of a very handy size and, when empty, many found use as water-boiling vessels. That they made suitable kettles and teapots was thus an automatic discovery. And so the "billy”- can was gradually introduced into general use. A quick-witted fellow, anticipating that it had arrived to stay, decided at once to arrange for the factory manufacture of cans of similar pattern, and before long there appeared on the market the billy-can, pint-pot and quart-pot. with neatly made lids and wire handles. Today they are sold in all sizes throughout Australasia and beyond by the millions: still simple, they remain much the same in shape and size as they were decades ago. Like a smoking pipe, the billy is not at its best until it becomes stained and blackened with usage—or, as the sundowner says, with "experience." Billy-boilng contests used to be popular in the Australian bush. The older the billy the quicker it boils. Experts carry billies burned to tissue-paper thinness, keeping them in calico coverings. Such billies will boil in two minutes. The competitors in these bush contests are required to gather leaves and wood, light fires, race to the creek and fill their billies, put them on and stoke the fires until the cans have boiled. Surreptitiously dropping a stone into another man's billy is an old camp-fire joke. When the other quart-pots are boiling the "doped"' billy has still a long way to go, and the owner usually cannot understand it. The Australian stockman's outfit should include four billies—of four quarts, three quarts, two quarts and one quart capacity; they fit inside each other, so that the set can be carried by one handle. 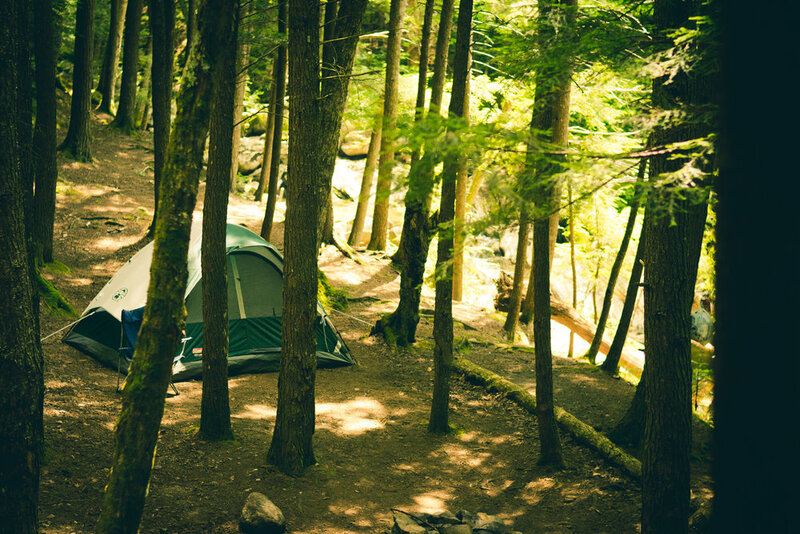 The largest size is used to carry water from the creek to the camp fire, the next to boil the mutton, the two-quart to hold the vegetables, and the smallest for tea. To boil a billy quickly, place length-wise on the ground a petrol tin and cut in it a round hole just smaller than the billy; then cut out from a side of the tin a square large enough to accommodate the sticks. Next punch small holes all around the tin so as to create a draught and when this has been done make a fire inside and place the billy over the hole. The billy is an essential part of every bushman's equipment. The original round, squat type is still the most popular, but several ingenious "improvements," including convertible and colapsible types, have been placed on the market. The drover's battered tin quart-pot is part of him. Being wider at the bottom than at the top, it is steadier and exposes more surface to the flame. A folding handle at the side enables it to be pushed into the fire, a mug fits into the top. The three-pint size is in most demand. A two-pint size is often carried inside it. The average bushman considers billy tea the drink of drinks. Even many wealthy squatters, while out on the run drafting and dipping, &c, prefer it to the kitchen-brewed tea—providing it is properly made. For there is an art in preparing good billy tea. Effort was once made to affix the trade name of "camp-kettle" to the billy-can, but it failed. Australians prefer the old tag. Henry Lawson’s famous "While the Billy Boils” should always remind us of the tradition that clings to the simple invention —an Australian heritage! Tea needs room to breath. By doing so, it allows for the tea to absorb and expand in the water which produces more flavours and aromas to be released into every cup. It is one of the many reasons why loose leaf tea wins over teabags every time. It's part of why we are all about loose leaf tea. Our tea allows you to get the most out of every cup in flavour & quality every time you put the kettle on. Our studio is getting involved in the Garage sale trail on Sunday the 22nd October. We will be selling a range of teas, hampers, tea ware plus some exciting new tea! PLUS will be brewing some iced tea for you all needing a refreshment from all the bargains! One of the best things about having a tea business is getting to try ALL the teas! These guys are from china. Time to put the kettle on! Happy first day of spring! Got my foot fingers out and drinking a lovely cup of tea to celebrate! This beauty is our new Organic Turkish Rose coming soon! This is what real tea should look like! No dustings from the floor put into a sad tea bag :( Just real whole leaves! No it's not a cutting of the earth, it's our new Organic Turmeric Latte being hand blended from all organic and natural ingredients. No artificial flavours, colours or sugars added. Just the real stuff! All our signature blends are hand blended and packed straight away to keep all the goodness in! This guy is our Organic Turmeric spice blended yesterday and one of my favourites! Do you all know how good ginger is for you? Spicy, sweet and refreshing! Made with Certified Organic Ginger, Lemon Grass, Hibiscus flowers and Calendula flowers this tea not only taste great but also helps stimulate circulation and aids digestion. We have some exciting new teas coming soon! 🙈including this golden cup of deliciousness!